or hybrid mobile application development is the talk of the town these days. If you’re still contemplating opting for native mobile application development or cross-platform mobile app development, you might want to consider some statistics before jumping on the bandwagon. — 60% of online traffic now originates from mobile devices. — The number of enterprise applications optimized for mobility will quadruple by end of 2016. — More than 80% of mobile time is spent on apps. — 3 seconds is the average time a mobile user will spend waiting for a page to load before going elsewhere. — By end of 2016, 50% of mobile apps will be hybrid. Is your techie sense tingling? Read between the lines and you’ll notice that more than revealing the market share, the figures talk about a slew of new entrants making headway into the smartphone OS space. This means sticking to one particular platform might not be a prudent strategy if you want your service or app to reach a bigger/wider audience base, that’s spread over various devices that employ these array of mobile platforms. — If you plan to have your service or app for multiple platforms; if so, you have the option to reuse the code, design or database that can save you a lot of effort at the same time maintain your app’s visibility across platforms. — About the extent to which you wish your service or app to be reusable. As mentioned above, the increased number of platforms requires you to focus, effectively, on few of them and build your service or app around them. And for the rest, you can have provisions in your code or design or database for extensions. — If usability and UI are your considerations. Creating a first impression through visual expression is the key. Cross-platform tools capable of producing identical UI designs and usability across platforms give your apps better acceptability. If you’re still undecided, there’s nothing surprising because you’d need to consider your target audience, the content, the interface, etc. And most critical of all is, where your app is destined to run. While there’s no denying that native code is robust, have support in terms of developer base and toolkits, a faster development due to reusing of existing codes; the flipside is finding and retaining the techies with the required expertise in the programming language used in native development. 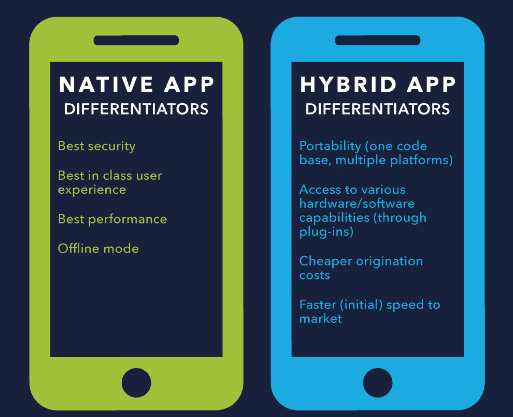 Native apps would mean that they are not cross-platform compatible, which lessens your apps’ reach thereby impacting your revenues. Cross-platform development and maintenance costs are nowhere near that of native development since native development requires QA testing and porting. On the same lines, native development to a large extent is outsourced which also adds to the cost factor. If cross-platform apps are to be really banked upon, it should be capable of accessing the features as native apps, such as location, camera, accelerometer, NFC, contacts, calendar, etc. Going by the current scheme of things, we can expect this capability to be built into cross-platform apps in 3 years completely. This is made possible by mobile browser APIs. Experts speculate that even if HTML5’s capabilities are enhanced multi-fold, variations in standards being implemented across devices and platforms can push the actualization of the desired results. Moreover, native apps employ revenue models that at times burn a hole in the pocket of the users and involve sharing of revenue for the use of its platform. On the other hand, with HTML5, a common click does the job; no App stores required. Cross-platform apps, give you direct control over your marketing/distribution activities without external interferences such as approval from third-party vendors as well as enable these apps to be deployed quickly. After all, when monetization of your apps is your intention, you got to be in control and cross-platform tools just do that for you. — A full array of development tools, supporting all aspects of cross-platform apps development. — Proven and tested code repository. — Decent development community and support groups providing active and passive support. — Ability to access device capabilities such as Audio/Video Capture, Geo-location, PIM contacts, Native maps, Screen rotation, Native Menu, Barcode, SMS, Calendar, Ringtone, Storage, Bluetooth, etc. Xamarin is one of the most popular tools for developing cross-platform apps. With Xamarin you can easily avoid bugs; therefore, increase software quality. Probably the greatest benefit for users of apps developed with Xamarin is an increase in software quality due to code reuse. It stands to reason that the chances of introducing platform-specific errors can be dramatically decreased when app code is written once and shared on different mobile platforms. Xamarin is fully integrated with the SDK of each platform. This allows developers to use the common API to access native controls that provide an authentic native experience. Xamarin compiles app code into native binaries instead of interpreting it on the fly, so you will not have to worry about your mobile app taking a performance hit. Titanium is based on the cross-compilation technique where JS, which is the main language, codebase is compiled into native code. A clear distinction between Titanium and other frameworks is the absence of a browser engine for UI, wherein it makes use of APIs to allow UI elements to be converted to native UI elements. The absence of browser means near-native experience such as enhanced responsiveness and fluidity. The developers have been able to provide detailed documentation and support for tablet and desktop development, enabling fast and easy setup. The existence of a good user and developer community means a lot in the efficient roll-out of apps. The downside is, Titanium is yet to venture into large or diverse phone sets. An inherent disadvantage of cross-platform apps is the generalization; jack of all trades, master none. Additionally, too much dependency on API leads to inconsistency with standards at certain levels. Titanium is currently compatible with Android, iOS, and BlackBerry. In Android, Titanium doesn’t have access to Barcode, Bluetooth and Ringtones, and has partial access to SMS and Contacts. With iPhone, it’s similar, except that it has full access to contacts unlike in Android. The crux of this tool is the JS API which gets access to device capabilities without going into the details of the platform. Built around HTML/JS/CSS, PhoneGap is more of a hybrid than a cross-platform tool due to the fact that it works by setting up native app wrappers along with embedded browser for UI and interaction with the device. The tool is highly flexible when it comes to customizing the apps according to the user needs since Phonegap doesn’t strictly ask the users to adhere to guidelines or instructions. Seasoned programmers would find PhoneGap to be highly user-friendly due to this factor. This is another reason why it’s compatible with almost all popular platforms out there. But, the less-experienced users can find this a bit tough to cope. A major lacking is the non-resemblance to native apps. Too much effort into perfecting cross-platform capabilities have impacted it looks and feel as well as consistency in access to device capabilities across platforms. However the ‘look and feel’ gap is plugged with the help of scores of other tools. PhoneGap is compatible with almost all the popular platforms namely, iPhone, Windows Mobile, BlackBerry, Android, Symbian, PalmOS, etc. The rate at which mobile technology is evolving makes it practically impossible to predict what’s in store. However, several industry analysts have come to a consensus that mobile development is non-exclusive of native and cross-platform and the emphasis should be on leveraging both options to render the maximum benefit to the user base. If you also want to develop your mobile app on the cross-platform, then contact PixelCrayons: A leading cross-platform mobile app development company in India.